I ordered this device about a year and a half ago for about $130USD. When I got it, I wasn’t terribly impressed but overall, for the price it’s not a bad unit. I figured it’s be nice to provide a short review of the device since there aren’t very many useful reviews out there. I have also done a video review which is posted on this page and on my Youtube channel at http://www.youtube.com/user/ElectroTark. 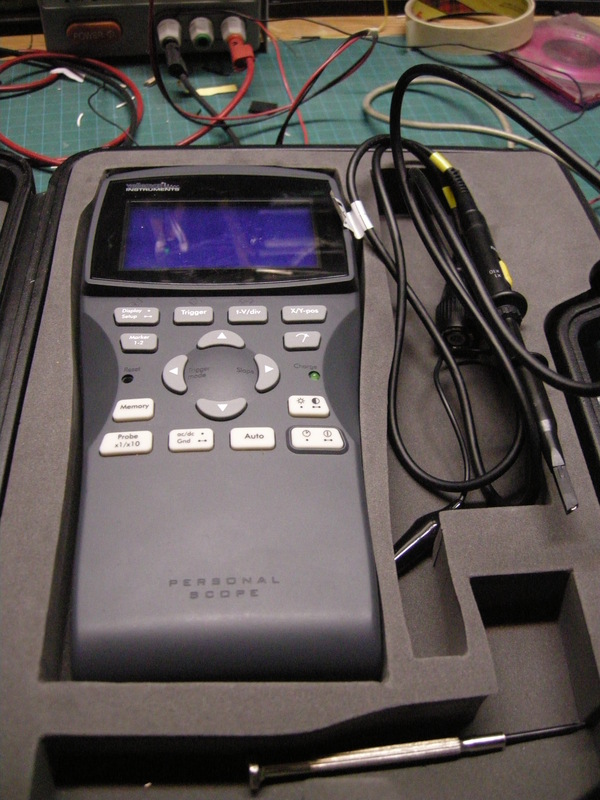 The HPS10se is a low cost oscilloscope with a backlit 128×64 screen. The video performance is actually OK and the waveform is reasonably easy to make out in most instances. This device boasts a 2MHZ bandwidth for analog signals and a 10MS/s sampling rate. While I have no doubt that these figures are true, my own tests show that any waveform shows severe degradation above about 1MHz, this is to be expected though. 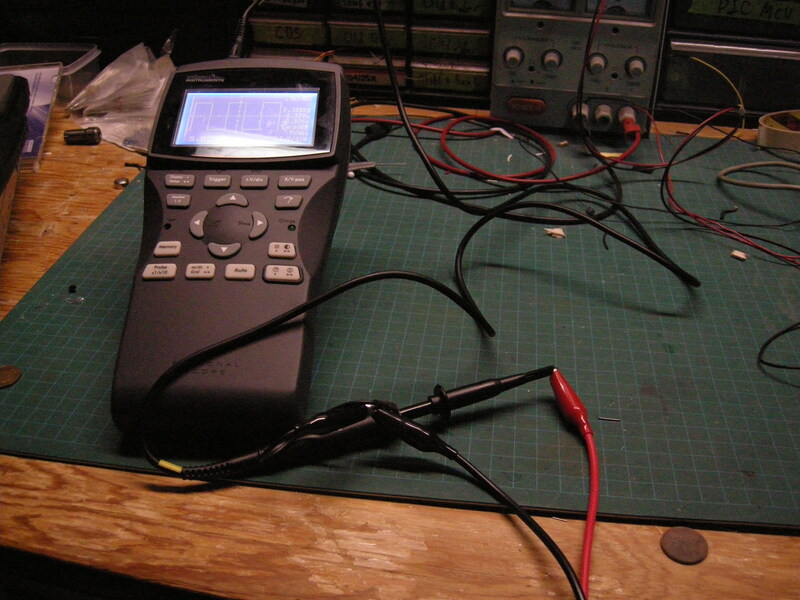 There is an option on the probe for x10 measurement which can be handy for high voltage measurement up to 600V. I’ve never used that feature on this but it’s easy to access with only a single button press. The device takes 5 AA batteries and can be run with an external wall wart, though it isn’t included. 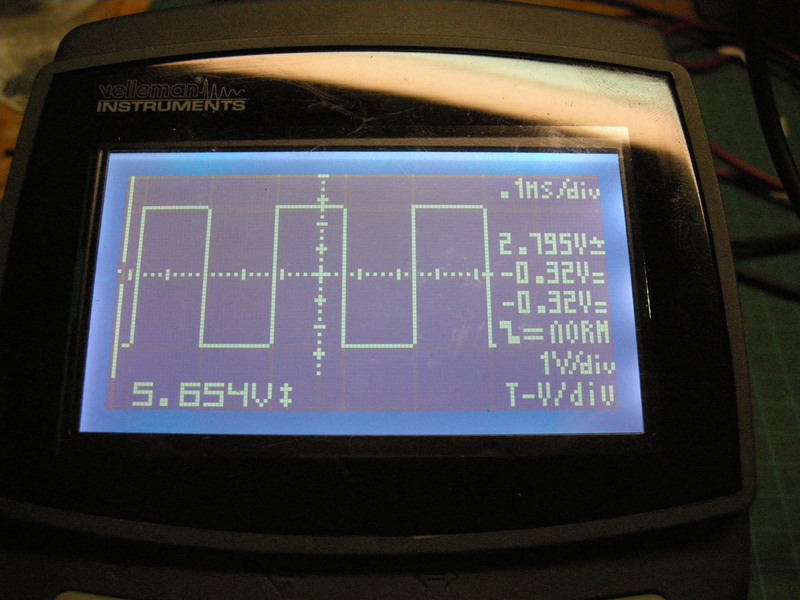 I use an old 9V converter with a 2.1mm by 5.5mm barrel connector, seems to work OK. It is rated at 9V and you might be able to use a 12V pack, though it may generate extra heat on the DC converter on-board. One problem I have with this device is the way it eats batteries, even when it’s off. Remember to remove the batteries when you’re not using it. As an extra note, it can charge NIMH batteries if they’re in there. 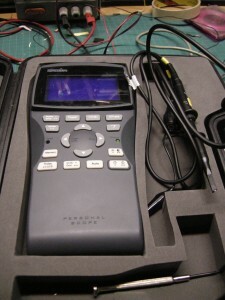 The device has some standard measurement options such as V-Peak+, V-Peak-, V-Range and Watts and dB. Since this is a low cost unit, it does not have a direct measurement for frequency and you cannot set the trigger level, you can however set its slope (Fall and Rise). You have to measure the frequency indirectly either by looking at the ticks and counting or by using the markers that you set, moving the markers to the start and end of one waveform gives you a frequency measurement in Hz. Anyways, here are some pros and cons. In closing, I would recommend this for people getting into electronics but for doing anything else, spend the extra money for a good/decent oscilloscope. The price, again, is pretty good. I have to agree, I’ve tried using it for various things and find it’s always the wrong tool for the job. It’s either not feature rich enough or it doesn’t show what I want. Recently bought a DSO1060 and I’m loving it. Next Next post: 55g servo drawing.